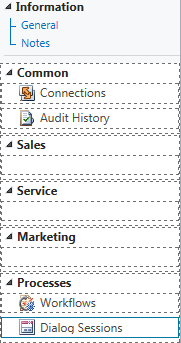 When customising forms in Microsoft Dynamics CRM 2011 it is possible to customise the Information Form Navigation Pane. One way on which the Navigation Pane may be customised is to rename the Group Names. This is sometimes desirable because it not possible to remove these groups or to add new ones. 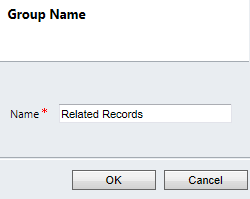 Note: Groups that have no related items, however, will not be displayed to users. The following screenshot shows the Information Form Navigation Pane in design view showing the standard Group Names, i.e. Common, Sales, Service, Marketing and Processes. 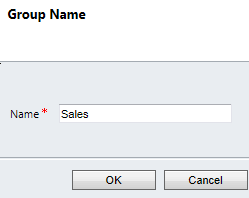 I recently customised the Information Form Navigation Pane for a custom Events entity by renaming some of the Group Names and adding some related items to each renamed Group. 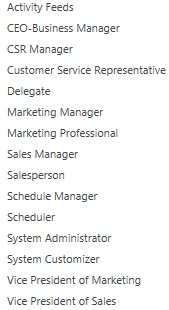 I renamed Marketing to Event Setup, Sales to Related Records and Service to Registration Fees. The following screenshots show the Sales Group being renamed to Related Records. After some testing I discovered that the Security Roles of the affected users needed to have the ISV Extensions privilege on the Customization tab to be selected as shown in the following screenshot. Once this privilege was selected, the custom Group Names where then correctly displayed for those users. In conclusion, it is therefore important when completing certain types of customisations, such as renaming the Group Names on Information Form Navigation Pane, that all users who need to see those customisations have the ISV Extensions privilege selected on the Security Roles assigned to them.